This proved to be a very popular topic when we first did it back in September 2012 so we thought we would revisit it again this year. Social media is always changing, the arrival of new tools and technology mean greater opportunities for social media marketing - it is important to know what’s available and what other brands are doing. The October New Media Breakfast will look back at the last year or so and explore what has changed; what new platforms have emerged and which are experiencing a decline in users. In addition to looking at the various platforms, we will take a look at some of the winners in social media; perhaps campaigns that have worked well, brands that have enjoyed success or people in social media who have experienced success in the past year. It would be wrong to simply focus on the winners, there are many social media losers out there and we can learn as much from them as we can from the winners. We will look at some of the social media marketing failures and investigate what went wrong; we hope this will help identify what not to do. Do you have a social media success story or do you know about a success that you would like us to highlight? Equally, please let us know if you know of any failures that we could perhaps review and share with your New Media Breakfast colleagues. 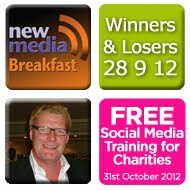 We hope you can make it along to this important breakfast to help us celebrate three successful years of New Media Breakfast and perhaps learn from other winners and losers.